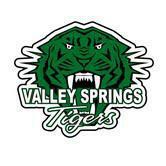 Want a Valley Springs Tiger t-shirt? Check out this order form! FALL SPORTS INCLUDE: CROSS COUNTRY, VOLLEYBALL, GOLF, TENNIS CHEER AND BASKETBALL. IF YOU ARE INTERESTED IN THESE SPORTS, PLEASE CONTACT THE SCHOOL (COACH) BY APRIL 1ST SO YOU CAN PARTICIPATE IN TRY-OUTS AND SUMMER PRACTICES/CAMPS THE TEAMS WILL HAVE TO PREPARE FOR THE FOLLOWING SCHOOL YEAR. SPRING SPORTS INCLUDE: TRACK, SOFTBALL, AND BASEBALL. IF YOU ARE INTERESTED IN THESE SPORTS, PLEASE CONTACT THE SCHOOL (COACH) BY JANUARY 1ST OF THE CURRENT SCHOOL YEAR. AND THEY WILL GET BACK WITH YOU ASAP!